Experience Cutting Edge and Lifelike Fully Immersive Simulators!! The Gander Mountain Academy (Lake Mary) Excursion will be a fun exciting day trip to experience this unique destination, one of only 6 such virtual shooting locations in the U.S.
Straight Shooters members who experienced previous Gander Moutain excursion call this "A Don't Miss Shooting Trip", saying you'll come back often. There is nothing else like it! Come join the fun! Gander Mountain Academy Simulators are stocked with a wide range of realistic scenarios. These fully immersive simulators are so cutting-edge and lifelike, until now only available to military and law enforcement. Virtual Ranges feel like the real thing. Each simulated bullet leaves a hole-punch in the simulated paper target! Round trip transportation in a comfortable Lamers deluxe motorcoach with reclining seats, refreshments, restroom, and numerous other amenities. We will depart at 9:00 AM from the Walmart parking lot located on Rt 466 in The Villages, returning at approximately 3:30 PM. The bus will park near the old vacated Pharmacy Drive Thru at the far west side of the parking lot. 90 minutes of rotation through Virtual and Simulator ranges. We will have exclusive access to 6 Virtual lanes, one 300 degree Simulators, and two 180 degree Simulators. At least ninety minutes to tour the facility and shop for that Gun Nut in your life!! Do not bring guns or ammunition as access for this excursion is only to virtual shooting ranges..... save your Ammo! What is the virtual range? Our one-of-a-kind virtual range is designed to replicate a live-fire range without the need for live ammunition. It features a two-million-pixel screen and multiple targets of your choice, which have simulated distances ranging from 3 to 50 yards. Real firearms are used (Glock or Beretta) which have been modified with a very life-like recoil kit. 300 degrees of the unexpected. These simulators are the ultimate in full-immersion virtual reality training. Five 8-foot by 10-foot screens surround you with action, so threats can approach you even from behind! The instructor-assisted scenarios are judgment-based, self-defense situations, designed to advance your decision-making skills, improve your marksmanship and sharpen your competitive edge. 180 degrees of enhanced speed, precision and marksmanship training, from basic marksmanship and steel targets, to randomized skill targets presented in real-world environments. 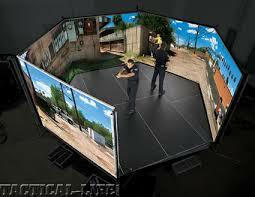 These simulators feature three 8-foot by 10-foot screens for the ultimate in reality based training. The marksmanship drills are a series of target-based scenarios, where you can measure your speed and accuracy and push for self-improvement at your own pace. Our exclusive Number One Gun scenarios are custom-built from to address the needs of our students.